It’s not officially here, but the air is crisp and the days are so much shorter. It’s almost as if the earth tilted just thatmuch and suddenly it’s no longer the summer that we’d grown so accustomed to. And yet, it’s not quite autumn. I’d always thought this was an Indian Summer, but I think it’s still too early. Regardless of what this is I am going to live up these last few weeks of summer-ish weather and continue trying to resist the twinges of hibernation-mode that are creeping up. Do you get those too? I am off to San Francisco tomorrow for a little getaway. It will be my first trip back since I was there to finish up my move so I’m a little anxious to see how things feel. So much of me loves that city, but there are also pieces that seemed so unforgiving. At least we have a packed itinerary of killer food and shopping. Yeah, it’ll be fiiiiine. Hoping you’ve got a lovely weekend ahead. Here are my faves from the week. Kiss! Transition camouflage. 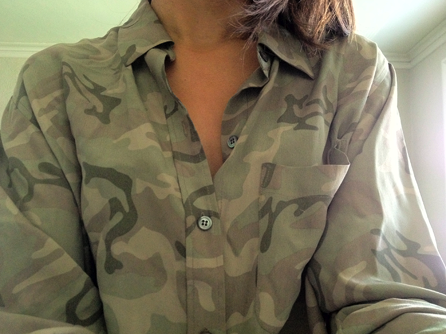 I’ve had this Equipment blouse for a few years now, and I’ve gotten so much use out of it. I don’t see the point in investing in the trendy camo skinny jeans (I just don’t see the longevity, and it’s almost too trendy if you know what I mean) so I’ll just stick to this guy which is quite versatile. 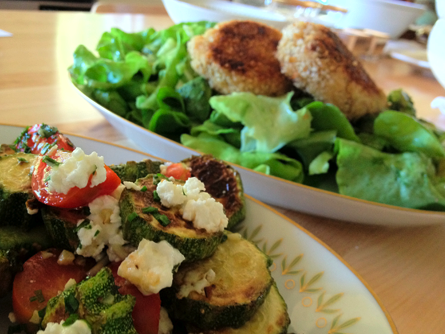 Courgettes and crabcakes. After yesterday’s post I realized how truly fortunate I am to be able to eat in that same way. My post-farmer’s market lunches with Andrew (my guy!) are some of my very favorite moments. A few simple ingredients with perfect seasonal and local vegetables. Playtime inside. One of the fun parts of the cold Seattle nights has been working to get the house in order, and by that I mean slowly taking over moving to Andrew’s house! While we have completely different tastes we’ve also found that we share a love of many things, including our new antique french cabinet from the 1900’s. This is the first nook we’re taking on. 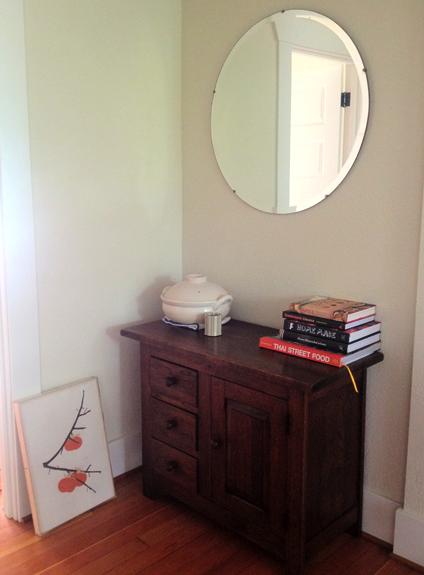 We just need a frame for the vintage persimmon print, a small lamp, and some girlier pieces to top it off.